Chris Pannell’s latest poetry book is A Nervous City (Wolsak and Wynn, 2013). 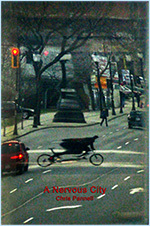 In 2010, his book Drive won the Acorn-Plantos People’s Poetry Prize and the Arts Hamilton Poetry Book of the Year. His other books include Under Old Stars, Everything Comes from Above, and Sorry I Spent Your Poem. He is also the author of a set of three poetry broadsheets which won the Hamilton and Region Arts Council Award in 1997. From 1993 to 2005 he ran the new writing workshop at Hamilton Artists Inc. and edited two book-length anthologies for the group. He helps organize the reading series Lit Live and Hamilton’s annual gritLiT literary festival.